Frank Lampard will be plotting Nottingham Forest's downfall. The Rams came away with three points from the DW Stadium on Saturday, but had to see off a determined Wigan Athletic side who were down to ten men within the first quarter hour as Kai Naismith was sent off for a professional foul on Harry Wilson. With the advantage, Jack Marriott marked his return with a headed goal from a great cross by Jayden Bogle. Marriott is now on eight goals. He’s scored three with each foot and two headers. The main focus now though will be on next Monday night’s East Midlands Derby against the red and whites from the other side of Brian Clough Way. Our rivals are looking good this season and are three points behind The Rams and currently sit seventh just outside the play off places. Last Saturday saw them suffer their third defeat of the season to Preston North End. They look like the strongest side that has graced that side of the A52 in many years. They are very dangerous in attack. 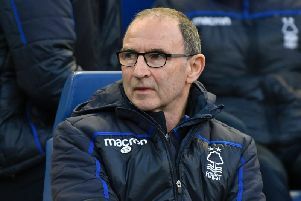 Joao Carvalho, Matty Cash and Joe Lolley bring a three-pronged attack behind striker Lewis Grabban who needs no introduction to any Championship football fan. Although he’s now in his 30s he still knows where the net is and has scored 15 goals so far this season. That’s impressive for any striker when we are still two games away from the halfway point of the season. He’s basically carried on where he left off for Sunderland and Aston Villa whom he played for last season. Make no mistake, our defence will have to be on top of their game on Monday night. One would expect that Jayden Bogle’s inexperience will be seen by them as a point of attack, but Keogh and Tomori will need to play their best games of the season so far to keep them at bay. If Forest have any weaknesses it’s in the defence. They can make errors when under pressure and have had a few injuries like ourselves to their back four. If Ben Osborn is playing at left back it will only be natural to target a player playing out of position. It’s not known yet if Michael Dawson will be fit, but on his day, despite his age, he can be up there with the best in the division. Costel Pantilimon played a blinder for them last season whilst on loan against us and kept them in the game, but his form in goal has been mixed thus far this season. They do have another option in Luke Steele, but the former is likely to get the nod. I see this as a game where both sides will score. A little bit of luck might be needed, but as always the butterflies will be in the stomachs of every fan inside Pride Park. Despite the rivalry, and despite the fact that I want us to beat them every single time we play, I actually hope that both sides can make it to the Premier League. Both have under-performed in the last 20 years or so and this fixture would make a perfect Super Sunday for the TV cameras. As long as it’s never switched to a Monday night again! We are Derby, they are Forest, and this is the biggest fixture in the East Midlands. Let’s get ready to rumble!